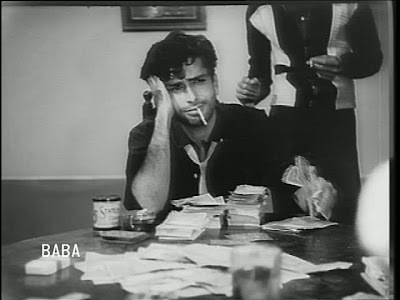 Meet Rakesh (Shashi Kapoor), a self-sabotaging philosopher/gambler who just wants to be understood and accepted for who he is. Although he does gamble with cash, his biggest risks are with his ethics and sense of self. 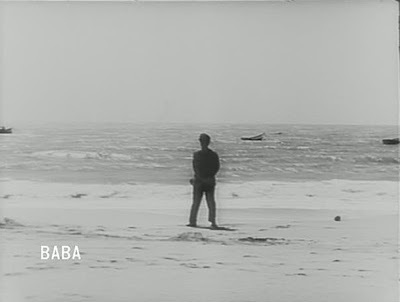 Because the film opens with him staring off into the sea as boats bob and waves crash before wandering distractedly towards the camera, we know he's got a lot on his mind and perhaps even feels a little lost and overwhelmed by the currents of life. But that's not all - the story quickly tells us a lot more about our hero. 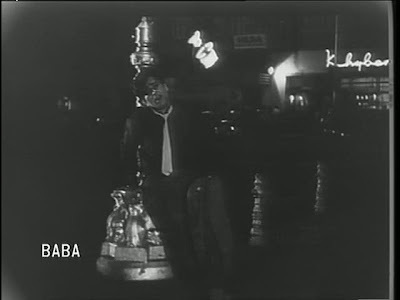 In the first five minutes, Rakesh helps out a friend in poverty (Renu - not sure of the actor) (and doesn't fight back when attacked by her distraught drunk father), admits heartache to a buddy on the street, knocks back a few, totters into a nightclub, and joins in the twist. I'm finding it tricky to talk about the film further without outlining more of the action, so here comes a plot summary. We left Rakesh at the nightclub; after grooving along for a few minutes on the dancefloor, he exchanges cross words with and is promptly beaten up by local shady type Bankey (Madan Puri), chucked out of the club, and left to stumble outcast through the nighttime streets of Bombay singing pathetically about being a gambler and reminiscing over lost love #1 (Sumitra, played by Tanuja). Maybe he had a good dinner at Khyber first? 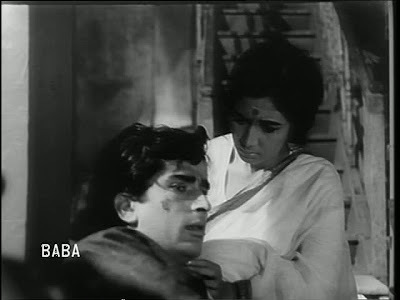 Lamenting the death of love, he collapses on the footpath, where he is found by kindly Saroj (Nanda). 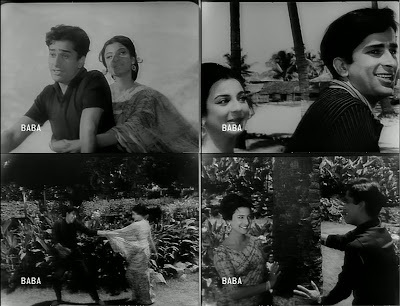 She listens to his tale of woe about Sumitra - who left him when he insisted that marriage is nothing but pain if the couple doesn't share values, implying that she's too materialistic to be happy with him - and continues to build him up even as he delves into Bankey's world to try to win money for Renu. This being Bollywood and all, it turns out her purely good heart is a great match for his passion to live life based on truth and shared values. In her company, he stops moping and finds a little joy in the calm, and she blossoms in the attention. 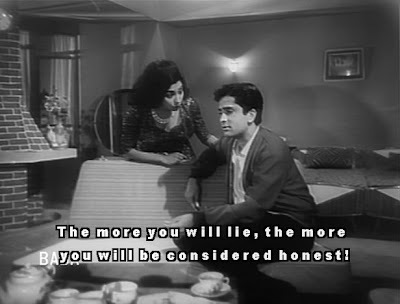 and hurls ill-informed insults at Saroj. Rakesh storms out, checks into a hotel, and heads straight for the bottle - apparently he believes in learning lessons the hard way. Luckily Renu is also visiting this hotel, and her new life as a cabaret dancer has given her insight into a whole new way to live: the slick, wealthy, not-a-care-in-the-world set can at least solve one's financial troubles, and she's sure his skills with the cards would rocket them to the top. No matter that they don't have much money to start with - the fake-pretend fortune they claim in order to bluff their way into high society can become real soon enough. A far cry from the kind of life Rakesh has tried to live, these people are more than happy to believe the lies of a charming, confident young man who can walk the walk and talk the talk. After all, what has Rakesh's relentless pursuit of honest living and professing his true character gotten him? 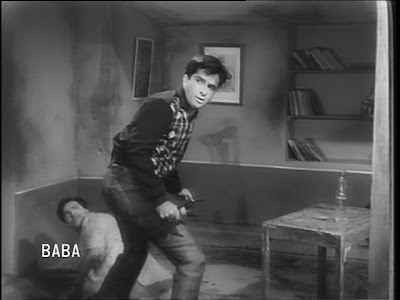 Young and mature loves dashed, two altercations with Bankey, and an irreparable rift with his status-obsessed father (Kamal Kapoor), which, this being Bollywood and all, is followed by his beloved Maa (Achala Sachdev) falling ill.
That's the crux of things for Rakesh: the honesty he so values has led him to despair, so in his most vulnerable moment of doubt and anguish over Saroj, he turns to the dark side - a life of lies and pretense. and rich suckers. Enter the princess (Kumari Naaz), who takes a real shine to Rakesh 2.0. But this being Bollywood and all, his new life is not as disentangled from his old life as he might hope. Re-enter Sumitra. She and her husband, a rich lawyer named Chari (Rehman) whom she married after Rakesh taunted her about being too interested in money to marry him (a poor philosopher, of course), are at the party too. 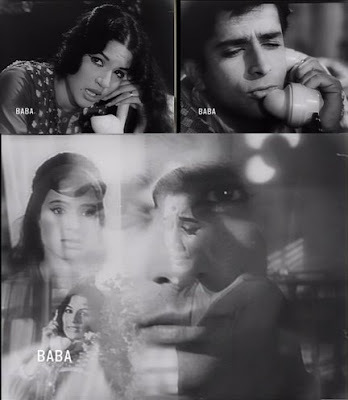 Chari is much older than Sumitra and Rakesh; the movie has previously shown her to be unhappy, and seeing Rakesh again just reinforces what she lost. Please note the proto-Anthony Gonsalves in the top hat. Simply put [Editor Self says: too late! ], I loved this. I found it complex and engaging with enough pep to keep things from getting too murky. 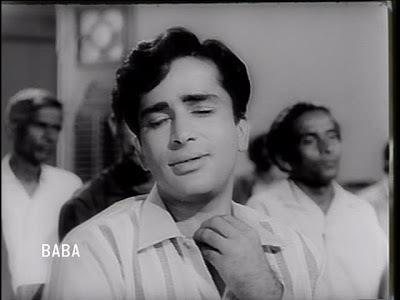 Shashi's finesse and gusto for expressing emotional attyaachaar is put through the paces as Rakesh slowly grows from bratty through sulky and limit-testing to genuine distress, empathy, and wisdom. Thank goodness he gets to take juvenile, sorry-for-myself Rakesh on a Dev.D-y path rather than that of the more famous boozey loser. 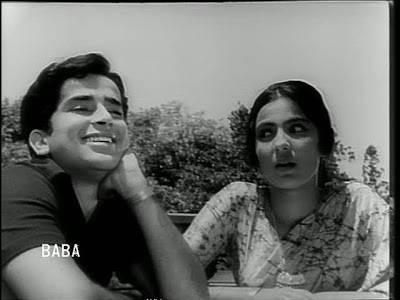 Tanuja and Kumari Naaz have smaller roles, but they're very good as well. 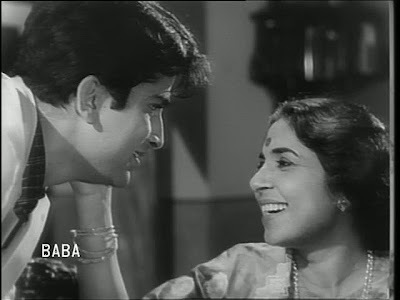 Tanuja is cute and smiling as Rakesh's first love, and she is very believable as the kind of young woman who cuts her losses with her beautiful philosopher to marry a grumpy old lawyer if the philosopher created an artificial rift and tried to shove her through it. (Which is exactly what Rakesh does; at the first hint Sumitra may not be perfect, he criticizes her until she leaves him.) Kumari Naaz is alluring and sharp as the independent princess who actively pursues what she wants. 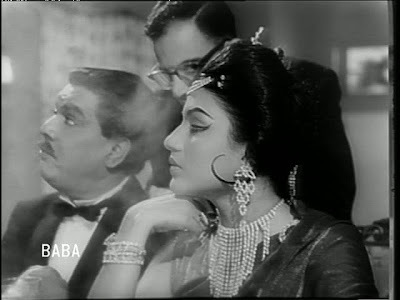 Nanda in turn is wonderful as the solid, quietly confident Saroj - the character is nearly disgustingly good and sacrificing, but there's something very mature about her, making me feel this person really is this way and makes her decisions thoughtfully rather than just doing what she's been told to do in order to keep her man. 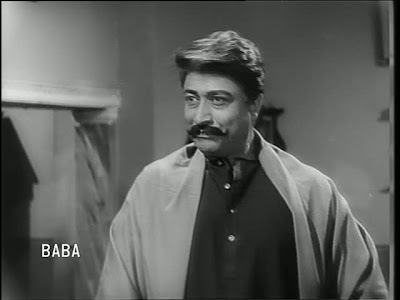 I was really impressed - this role would have been easy to overdo, leaving Saroj unlikable and tiresome. Saroj is really, really, really good: as people in her chawl wonder why she's brought another man home, a friend defends her character as being as pure as the Ganges as the camera shifts focus to her pouring water over Rakesh's soapy hands. He can hear the people talking in the courtyard below and looks up at her in wonder as the water falls. Wow! He (and only he) is the one who changes in order to make the relationship to work! My only complaint is that the "older but wiser" reunited couple seems to have lost some of their joie de vivre, and I'd hate to think that's a necessary sacrifice for wisdom. In addition to being a good think and listen, so to speak, Juaari is a good watch as well. 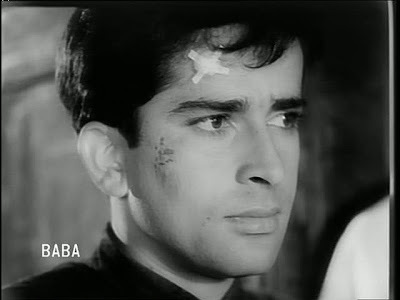 Editor Self is going to lose the battle over including screen captures; if you don't want to see a lot of pictures of sad, wounded, and/or vulnerable Shashi (told you it was for the Shashi-loving emo sadists!) (plus a few of the other people in the movie), you may be excused to hop down to the links to the songs, about which I would love to know your opinion. Song cuteness! 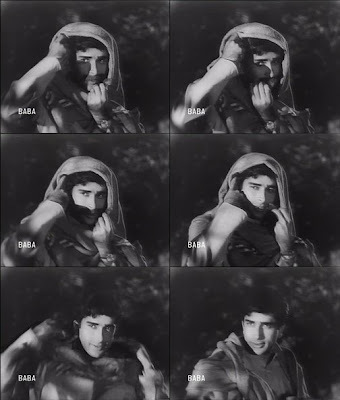 "Neend Ud Jaye Teri" (thanks to Bollyviewer for finding it for me! ), the last song in the movie, is so great. It interweaves the three love interests, all misty for Rakesh. 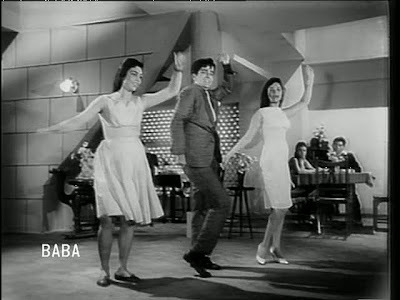 "Na Jane Kya Karegi" with the yong lovebirds is appropriately 60s boppy and sweet. 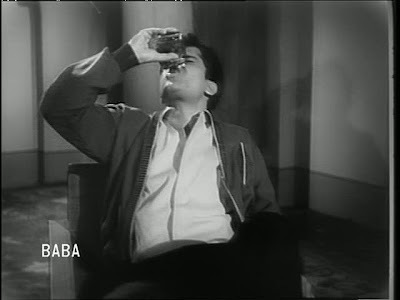 The Baba Traders DVD did not subtitle songs, but "Main Hoon Badnaam Juaari" seemed so sad - and gave Shashi an opportunity to showcase his abilities at physical expression (or practice his drunking, however you want to say it). 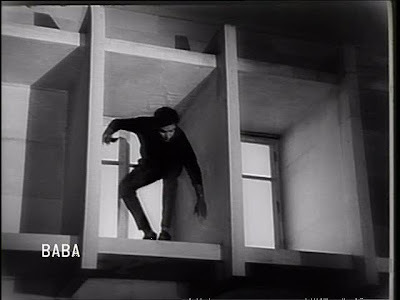 And because ending on sad drunking is a downer, and Editor Self is going to take away the computer if I don't stop posthaste, check out Rakesh's impressive gardener disguise, which he uses to trap Bankey in a dangerous admission. Who is this warpped-up, mustachioed man? 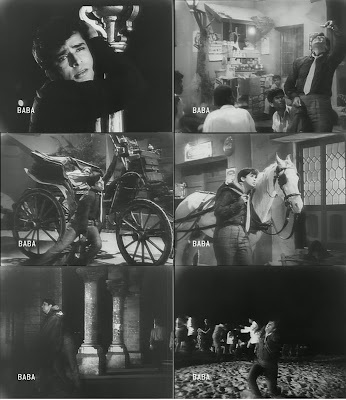 * Courtesy of Kalyanji-Anandji with an assist by Laxmikant-Pyarelal (if I understand the credits correctly) and an interesting, varied background music that includes brassy riffs for the gamblins scenes, western classical music, and nods to other films, including a snippet of Aamne Samne's "Nain Milakar Chain Churana". ** And the most assertive female character is shot dead in cold blood in her home, but never mind. Lovely screencaps, Beth. They bring the movie back! Not sure why you couldnt find it, but here is Neend ud jaye teri. Its interesting to note that the two non-heroines (one who was wicked enough to marry for money and the other who was wicked enough to have it!) get Mubarak Begum's voice while Nanda gets Lata's voice. Lata=force of goodness? 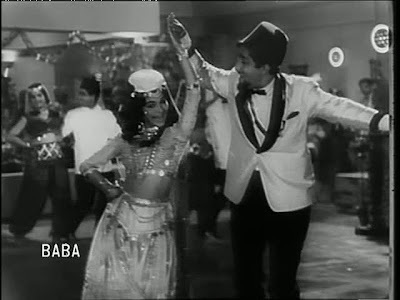 Also, the cabaret dancer Renu is probably played by Madhavi. One thing that did strike me as odd was that an idealist like Rakesh had no problems with gambling. Surely as vices go, its a lot less romantic than drinking (a la Devdas) and therefore less acceptable in an idealist? 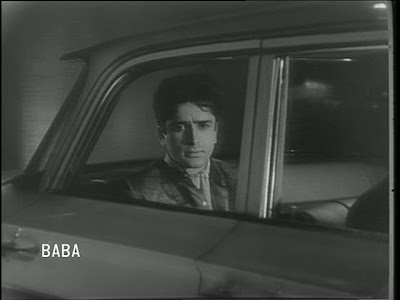 This is probably the only Shashi-Nanda starrer I haven't seen. 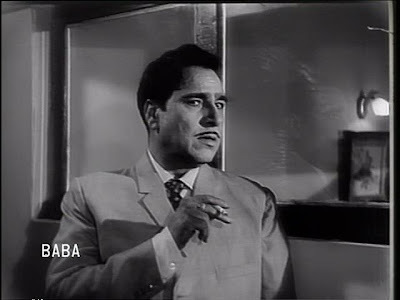 But I've seen Neend ud jaaye teri often enough on TV, and always got irritated with one of the singers who had a particularly shrill voice - more like a wail than anything else. Must add this to my list of to-watch films. Why does editor-self not like screencaps? I thought it was a good movie; entertaining but also thought provoking. Mehendi lagi ... is quite different and I found Nanda's character a bit irritating. I just love the songs of this movie. Thanks also for the info, that LP were assistants of KA. 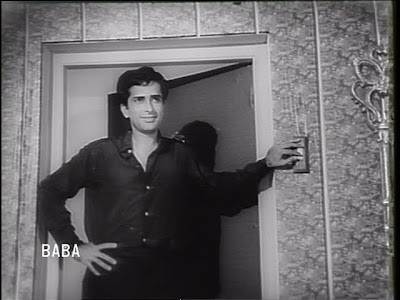 Shashi looks great as usual! 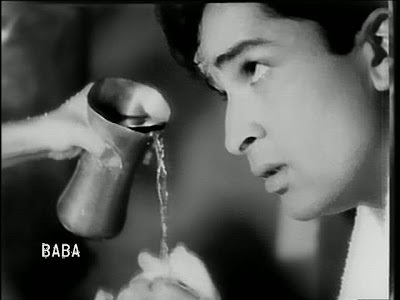 The ultimate Shashi movie for meeeee!!!! Will barrage the DVDwallahs TOOTSWEET. OH, BETH. Thanks for bringing this to my attention. This looks so cool! Where did you find it? I liked it too, although I need to watch it again to feel like I understand it. It's an interesting film! bollyviewer - Excellent catch re: voices! 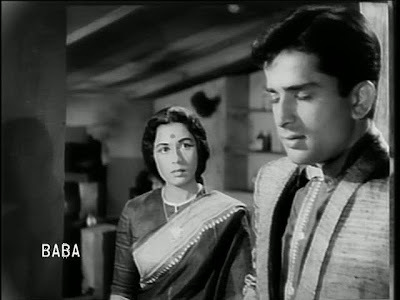 I was wondering about Madhavi too, but the imdb link for her goes to the wrong entry (for someone born in the early 60s, so clearly not this actor), and then I got confused and stopped digging :) Now that I think about it, does the film tie up Renu's thread? It doesn't, does it? dustedoff - I really liked it - there's a lot to think about in it! gebruss - Editor Self's job is to rein things in. She likes screencaps but also likes not overwhelming people. harvey - Glad you liked! The music is wonderful. PPCC - Yes, you must see this. I think it was made for you specifically. I haven't gone into all the threads of Rakesh's philosophical wandering but once you see it we can dissect it further. Or you'll hate it, simply due to the laws of the universe that cause heart/brainfelt predictions to go awry. But I think you'll love it. ajnabi - Eros, but apparently they don't have it any more. Nehaflix also lists it but it's out of stock. Hmmm. Let's hope PPCC's DVDwallahs can come through! 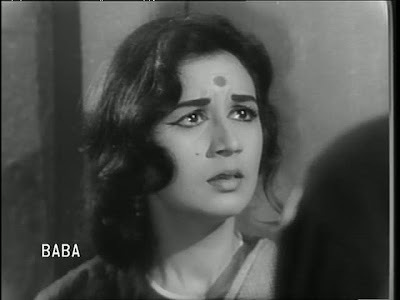 memsaab - I felt like that too. I watched it 2.5 times before even trying to write, and I haven't touched on a lot of the ideas that came up while viewing - too much! too much! 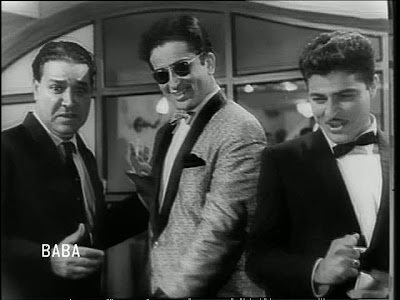 "Neend ud jaye teri" is a great entry in a very niche genre of Hindi film songs - the "cursing" song, where ill-wishes are heaped on the ex-beloved. 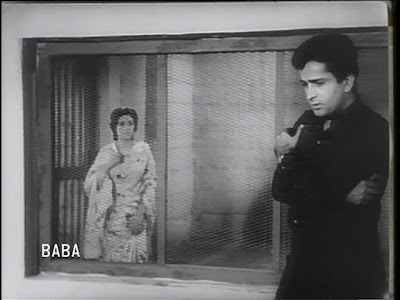 :-) Incidentally, the song features three singers: Mubarak Begun for Renu, Krishna Bose for Tanuja and Suman Kalyanpur(not Lata) for Nanda. 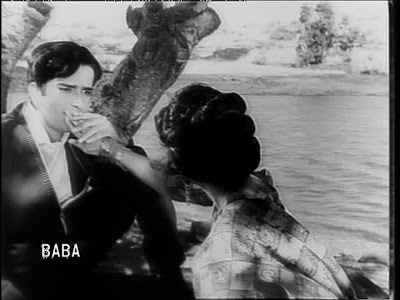 Despite their apparent popularity, I don't much care for the Shashi-Nanda jodi. 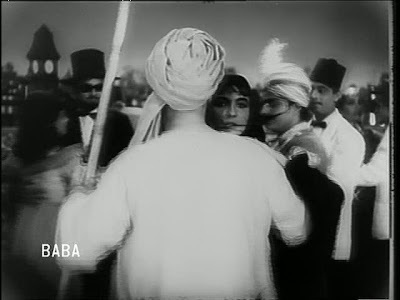 "Rootha Na Karo" is probably the only movie of the two that I really like. You know, somehow I've never really considered them as a jodi, despite having seen five of their films (haven't posted about Mehndi Lagi Mere Haath yet). I guess I'm lukewarm. They look okay together, and she's a nice calm presence to his shenanigans or histrionics. I hate Jab Jab Phool Khile but that's not their fault.